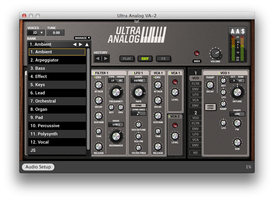 Ultra Analog VA-2, Virtual Modular Synth from Applied Acoustics Systems. 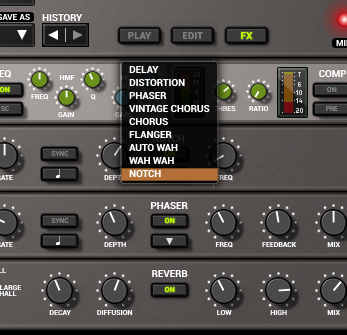 AAS renews its virtual analog synth by adding VA-2 to its name. But that is obviously not the only change. Here's a detailed overview. 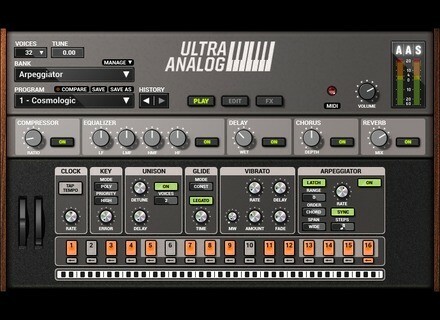 VA. Used as a prefix or suffix depending on the manufacturer, this acronym is supposed to guarantee the authenticity of the software (or of the technology used in a hardware synth, like the VA-1 synthesis for Kurzweil series K and PC) in terms of its analog behavior (VA stands for Virtual Analog). 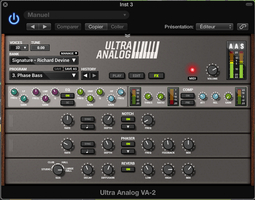 Sometimes it is more or less concealed, integrated as part of the name, like in the case of one of the most recent and most convincing software synths: U-He's Diva (where Diva stands for Dinosaur Impersonating Virtual Analogue). 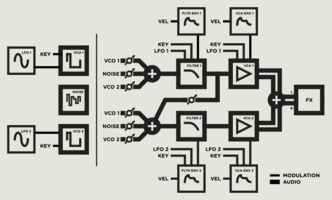 Obviously, you shouldn't judge a book by its cover or a synth by its name for that matter. 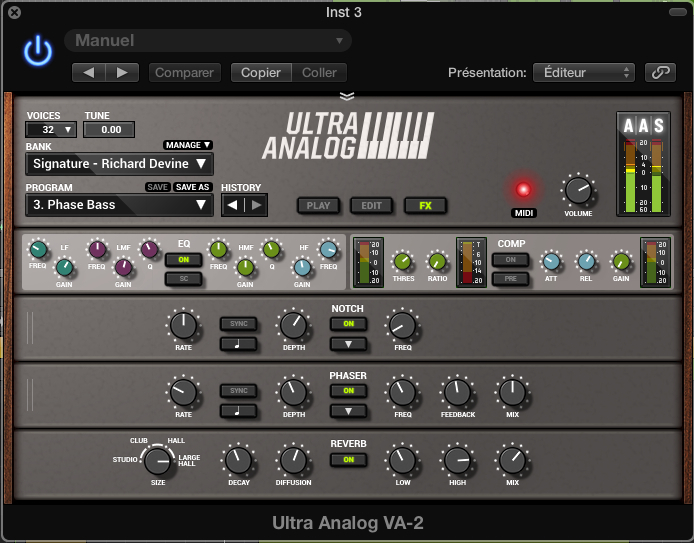 Several years ago Applied Acoustic Systems introduced a very interesting analog-like synth, simply (but not humbly...) named Ultra Analog (we occasionally find VA-1 attached to it, but its not visible on the interface). The promises were kept at the time, despite a rather unsophisticated configuration compared to the possibilities available today, both in the hardware and in the software worlds. Champion of physical modeling with its flagship Tassman (in version 4 today), AAS has successfully rendered many instruments utilizing the technology they master and making it more accessible and immediate, like with Chromaphone, Lounge Lizard or Ultra Analog (first and second version). Let's see what the latest version of the latter has to offer. 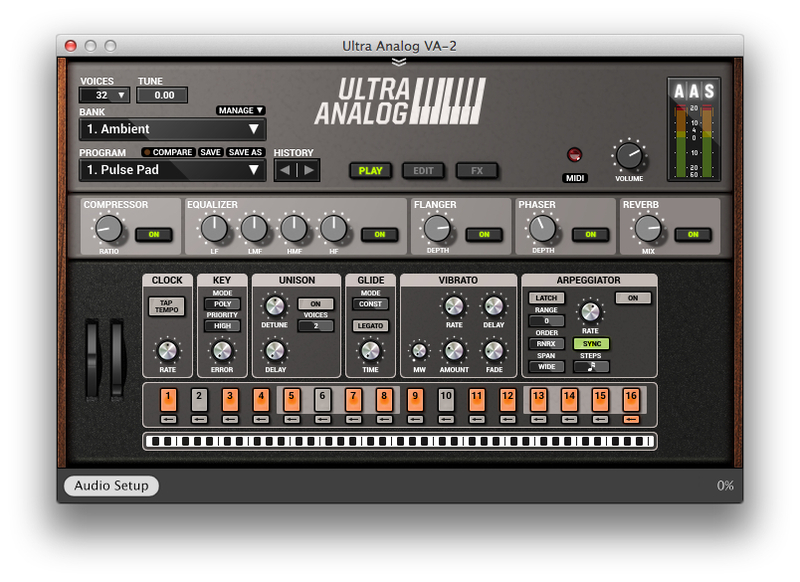 The developer offers the synth in three different forms: complete for $149, and updates from the first version for $29 and from Ultra Analog Session (a limited version of the synth) for $49. 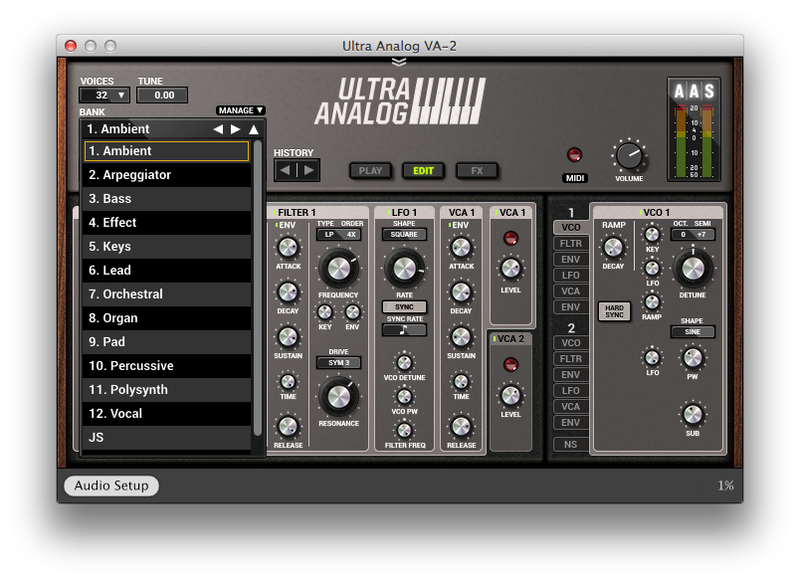 From a compatibility and format point of view, Ultra Analog VA-2 can be installed on a Mac or a PC as a standalone version but also as Audio Unit, VST, RTAS and AAX plug-in. First big change: the porting to 64 bits, which allows us to finally do away with the different bridges available depending on the host software. The installation and online authorization with serial number (two authorizations possible with one single serial, thank you) went without a problem. Now we only have to see and hear what is concealed underneath the new GUI. The software offers two menus to access the presets, Bank and Program. A small graphic detail: the navigation arrows appear when we hover over them. By clicking on the Manage field, the plug-in displays the other available window, called Bank Manager. We also have at our disposal tools to rename, create, save, delete, move, and copy banks and/or programs, review the author of a preset and add information. Everything is clear, clean and functional. Well done AAS. The first obvious thing you'll notice when you open it for the first time are the changes to the GUI. It adopts the same look and organization seen on Chromaphone, apparently taken from Lounge Lizard 4. The size of the main window is the same and it is still split into three views. 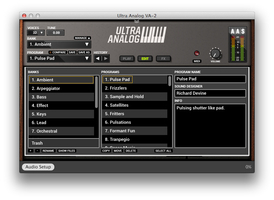 The operation of the upper part seems pretty similar (see the text box too), the effects view is the same as on LL4, meaning we have fixed EQ, Compressor and Reverb modules (which can be switched off), plus two empty slots to choose from nine effects, each of which has a very comprehensive list of settings. 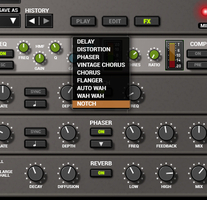 The publisher added a good Vintage Chorus that works according to three modes, Chorus, Flanger 1 and 2. Here's the first audio example, first without anything and then passing through all three modes with different settings. The Play view groups all playing settings (who would've thought...), including polyphony (32 max), modes and modules (mono, unison, stereo, legato, etc. 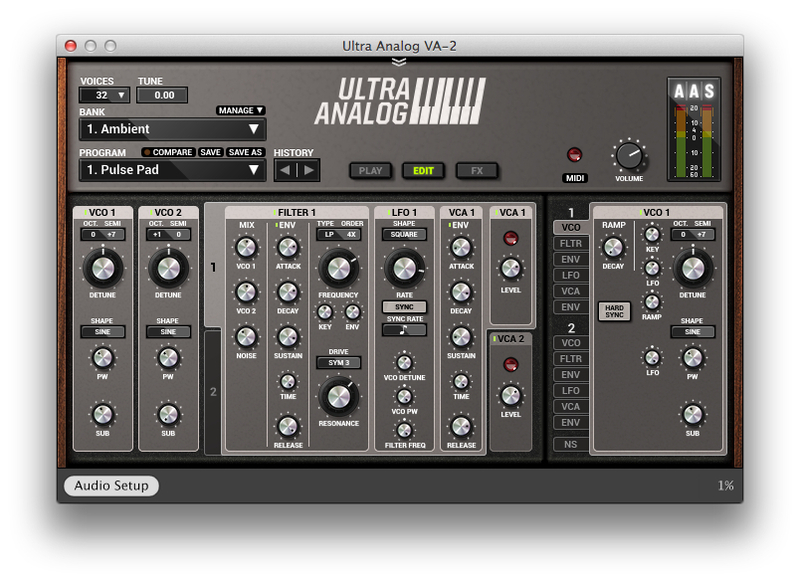 ), the vibrato (with a knob to control its response to the mod wheel, nice! 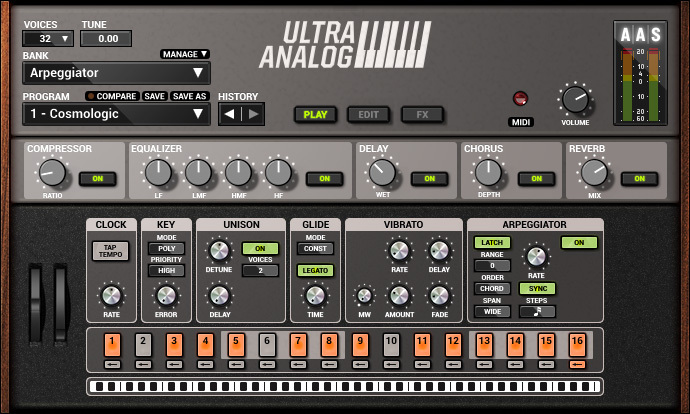 ), as well as the arpeggiator, which is one of the biggest beneficiaries of this update, thanks to a much clearer presentation, especially concerning the programmable steps. The tiny squares of the first version weren't the best usability example. 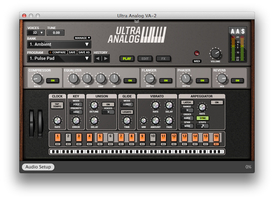 The window also features activation buttons and knobs for the effects' most obvious functions, which —don't forget — have their own dedicated page. 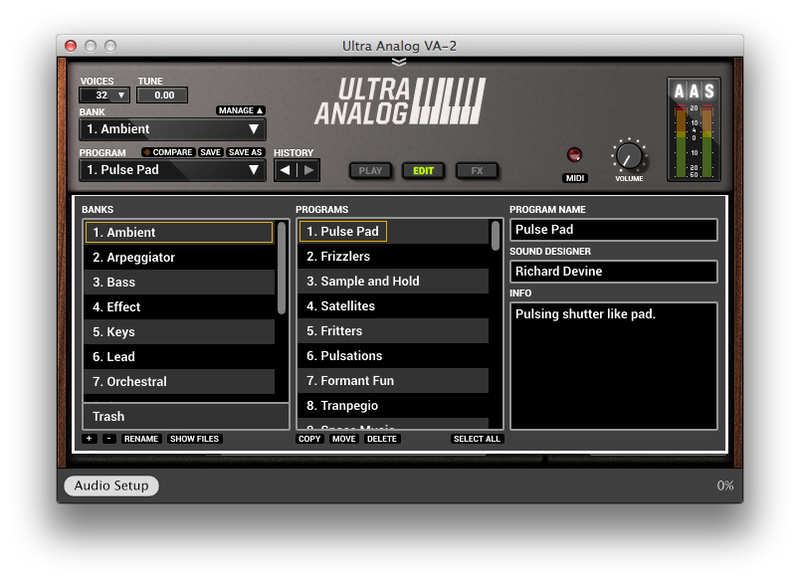 The big loser with the update: the Recorder module that allows us to record as audio what we are playing in real time. The overall presentation of the sound generation elements (the synth itself) has changed, some functions have been renamed, some others moved to different modules (which originated with Tassman), but the operation and routing seem identical to the first version: two oscillators with four waveforms (Saw, Sine, Square, and Noise), with PW, Sync, Slave and Sub mode, two multimode and multi-bandwidth resonant filters (LP, BP, Notch, HP, For(mant)1, For2, second and fourth order), with Drive included (six types of saturation), key follow and envelope action rate, a noise generator, two separate amps, two LFOs, two volume envelopes, and two filter envelops (all envelopes feature a very useful Time control to override the Sustain if so desired, which allows us to make the note fall even if the key is still depressed). We have direct access to the most common features, while all other options are available via Advanced Settings. We also welcome the arrival of a second formant filter. The sound library, apparently taken in its entirety from the previous version (we had no time to test all hundreds of presets), benefits from 110 additional presets by Richard Devine. For the sake of comparison, here are a few presets after verifying the settings were identical. Version 1 is always first. We can observe several (very slight) differences in the highs, the Vintage Chorus' "softening" effect, as well as a different handling of transients depending on the use or not of the compressor. To wrap it up, a couple of presets authored by Devine. 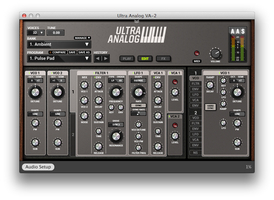 Ultra Analog VA-2 will be familiar to users of the first version, in spite of the cosmetic changes that sometimes lead to a slowing down when designing sounds. The contribution of the new filter and Vintage Chorus is clear enough, as well as that of other effects, including the EQ and the compressor. 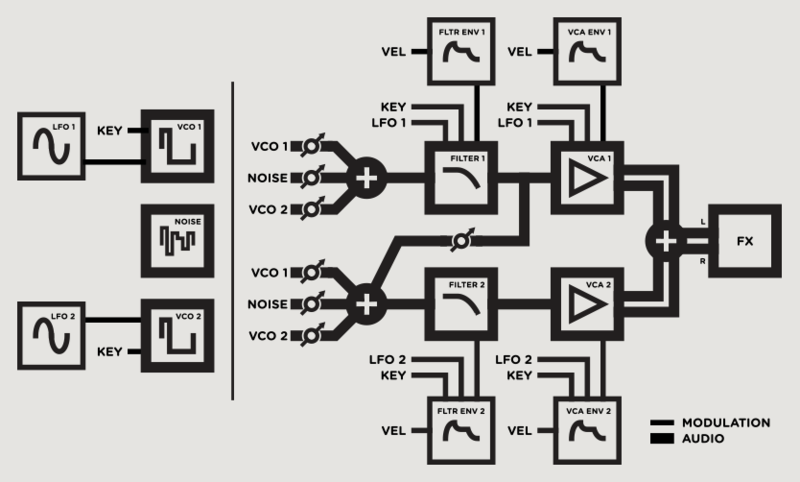 Certain choices aren't easy to understand, and we do not like the fact of having a limiter at the output that can't be switched off. The intentions are certainly good, considering that we often have quite violent peaks when experimenting with it, but it is also desirable to be able to have some control over such type of processing. 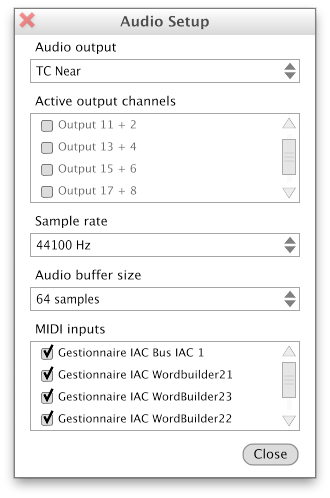 Another criticism, despite a very easy-to-use Midi Learn feature, aftertouch has been assigned to none of the programs. This forces us to do it ourselves but without the possibility of limiting its range.